When I reviewed Dina Wakley’s last book Art Journal Freedom, I loved its approach to surface design, composition and use of colour. This book is about facing your fears if you have trouble getting over hurdles in your approach to surface design. This book is also like its predecessor in that it is a really inspirational book. It broaches common stumbling blocks in this kind of approach to design, and provides step-by-step tutorials on how to overcome them. They are fearless in their approach, but effective in their results. Most of us will have the general assortment of tools and materials that are required for surface design and journaling. Pens, paper, inks, paints, stencils, stamps and baby wipes make up the core materials that are used in this book, and these basics will cover you for some of the exercises. The book starts with prompts and encouragements to give you an idea of what you could include in your designs. Here there is a good section on using your handwriting, with encouragement to practice if you feel your writing is not of a good enough standard. Practice is the key word here, with particular attention to drawing. The suggestion that people ‘can’t draw’ is refuted and the emphasis put on practice, even if you just start with one shape drawn again and again, day after day. Saying that, there is no pretension show here and a section (and further exercises) covers tracing, with Dina Wakley assuring us all that many artists use tracing as a method of getting started or ensuring the correct proportions and perspectives are achieved. No-one need feel under pressure to do without some assistance if it gets you moving onto the next stage. Dina Wakley’s work often contains portraits or silhouettes and the use of yourself in your art is covered in several ways, and there is a great tutorial for creating a stencil of yourself which I followed easily. This is a good section for including figures, whether by using photos which are incorporated or painted over, or by tracing or cutting out figures. 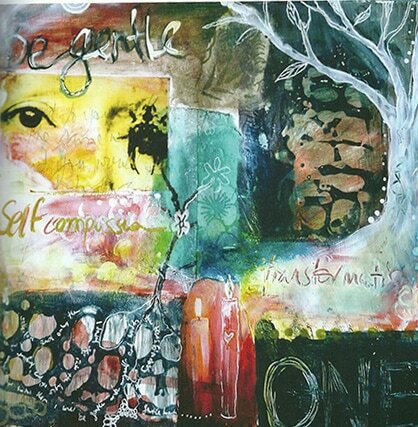 It is a great book to follow on from Art Journal Freedom and I think it encourages the reader not to make excuses, but find ways of finding your artistic expression. This review was originally published in the June 2015 issue of Workshop on the Web. If you love the freedom of style you see in Art Journalling but can never seem to replicate it in a successful way, it might be that your composition and colour choices are a bit off. This book acknowledges that this artform can be very much a means of personal expression, but it does all seem to go wrong, there is a way of rectifying those problems. This is a pretty amazing book in terms of all the subjects it covers, the examples of work shown throughout and the wealth of knowledge that is imparted here. The book is split into 2 sections, dealing with Colour, and Composition. Each of these sections has 4 chapters each with a ‘Putting it all together’ chapter at the end. It is incredibly informative, with in-depth explorations of each area. The Composition chapters are on Symmetry and Asymmettry, using white space as a way of creating a striking piece of work, how to work with dominant images, using the rule of thirds, and text. There is too much to list here, but any reader who is struggling with design and placement will really benefit from the tutorials given here. In terms of colour, there is a look at how to use the colour wheel, creating a colour palette for different effects, using contrasting colours, inks, gel mediums, colours to create visual paths and also using black and white to compose work (rather than concentrate on colourful colours). Originally published in Workshop on the Web September 2013. A very interesting premise for a book, in that Seth Apter, both an artist and a psychologist, has combined these areas and created a book looking inside the minds of mixed-media artists to try and unlock the mystery of hidden messages in art. Divided into three main sections, the first part introduces 30 artists, showing a photo of them at work, a piece of their art, three things they are inspired by and four things on their studio table. The latter particularly offers an insight into how all these artists work, with such diverse inspirations as ‘the tin box in the movie Amelie’ or ‘a great espresso drink’, and tools such as ‘a racoon spinal column’ or ‘Uncertainty’. Moving on, the next section looks at further works of art created by thought-provoking prompts, such as The Child Within, Free Association or My Destiny. These are interspersed with a series of questions put to each artist, such as ‘What is the best piece of advice you have ever received with respect to being an artist?’ The answers are illuminating and make interesting reading. Also in this section are several spotlights on pieces of work being created, so you get illustrated steps to show how a piece evolved. This is followed by a Gallery of fourteen more artists who created works from one of four prompts and who give a small explanation of what the art means. You can see the influence of Seth Apter’s psychology background very clearly in the book. It looks at how artists operate and function as part of the process of creating art and gives us some background into how these particular artists think, feel and approach their art. It isn’t a book which teaches you any particular techniques, although there are elements of that here. It digs deeper and lays bare the insecurities, priorities and inspirations of the artists. The surveys that are dotted around are very revealing and give the reader a feeling of kinship with other artists, and knowing that most people, no matter how successful or established, are still susceptible to feelings of unworthiness and doubt. This is a very interesting book and an unexpected approach to mixed-media art which I enjoyed reading. In moments of self-doubt or creative block, this would be a good book to refer back to, because there are so many artists with different approaches and the guidance inside can act as a reassurance and inspiration. 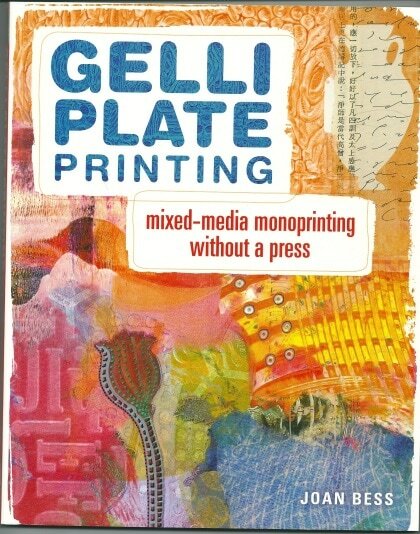 Joan Bess is the creator of Gelli Plates and this book brings together many different techniques and approaches to using your Gelli Plate that many readers will find an invaluable companion to their printing tool. Simply structured into two parts, Getting Started with Gelli and Gelli Techniques, this book launches straight into all you need to know. The housekeeping dos and don’ts are dealt with quickly and efficiently and then the fun begins. The book takes you through technique after technique with subtle variations, use of different substrates and paints, and pretty much covers all bases. 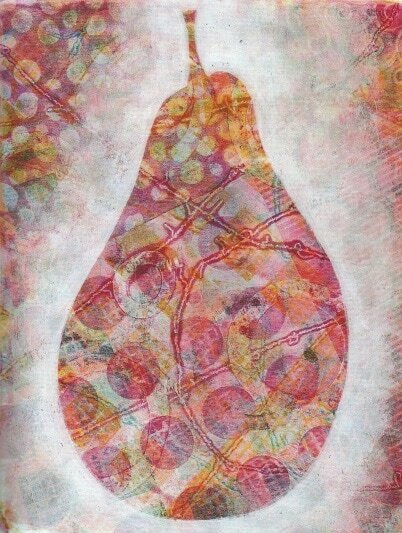 Each technique builds on the previous one, and so you start with basic printing, moving onto adding or taking away paint from the Gelli before printing to create patterns and textures. You see how masks, stencils, stamps, natural objects and embossing plates can be used, and how pattern is introduced Texture in many forms is explored, different painting approaches are listed and the use of other elements, such as die-cut shapes, moldable foam or packing tape are all introduced in an effort to cover all bases. And for a book on Gelli printing, it does this exactly. I cannot think of anything that could have been left out, or a technique that I wished had been included, as it all seems to be in there. Once you have your print, it looks at further ways of making it more interesting. Overdyeing, using the back of a print, using digital manipulation to enrich a print, all of these are also covered. And variations for each technique are given at the end of each illustrated instruction, so you are looking at multiple different prints with endless possibilities before you. The book ends with a gallery of mixed-media artists who have created their own Gelli prints and talk us through their process of doing so. All these prints are wildly different and show the artists’ personal style off well. Artists such as Julie Fei-Fan Balzer, Lesley Riley, Dina Wakley and Alisa Burke all contribute here and it is fascinating to hear how their complex prints were created. For those readers who have been inspired by our Gelli Plate articles, this is a good book to have nearby. All the techniques that are included have easy to follow instructions and are likely to cause an inordinate amount of time trying out new skills.